BALTIMORE, MD--(Marketwire - March 4, 2011) - An eco-friendly environment for Baltimore travelers is now available at the Fairfield Inn & Suites Baltimore Downtown/Inner Harbor Hotel, where integrated environmentally-friendly actions have resulted in the property being named as the Baltimore's first LEED-certified hotel property. 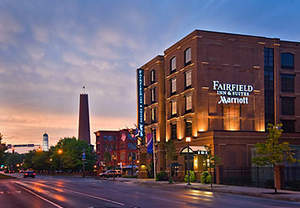 Accepting the responsibility for Leadership in Energy and Environmental Design (LEED), the Fairfield Inn & Suites takes pride in being the first among Baltimore green hotels to receive this certification and values the careful compliance that results in a healthier and safer environment for guests. The hotel's energy-efficient actions also lead to reduced waste, improved energy and water conservation in addition to reducing harmful greenhouse gas emissions. As the leader among Baltimore LEED-certified hotels, the hotel maintains its commitment to environmental stewardship and social responsibility while providing guests with the value, comfort and service they deserve. In extending its drive to provide a healthy environment, the hotel is also smoke-free. Conveniently located near Johns Hopkins Hospital and the Kreiger Children's Institute, the Fairfield Inn & Suites provides guests with spacious rooms and comfortable extended stay suites to meet their travel needs. All rooms feature marble bathrooms, luxury linens, a large desk, two phones and complimentary high-speed Internet access. In-room entertainment includes a 42-inch HDTV with cable/satellite service and premium movie channels. All guests are offered a complimentary continental breakfast featuring ham, egg and cheddar breakfast quiche and Jimmy Dean breakfast sandwiches. The hotel is also home to the Tavern 101, open daily for lunch and dinner in the hotel lobby and offering classic American cuisine in a sports bar atmosphere. Maryland crab, burgers and wings are served along with a variety of drinks. The Fairfield Inn & Suites Baltimore Downtown/Inner Harbor is distinguished among LEED-certified hotels offering guests meticulous accommodations and outstanding services. With its Downtown/Inner Harbor location, guests are conveniently located near many of the area's popular restaurants, shopping and entertainment venues allowing travelers the opportunity to create exceptional Baltimore vacations and getaways. Located in the heart of Baltimore's Inner Harbor Area we are close to so much you will have trouble deciding what to do first.